We’re all getting a little wary of predicting how this 2016 Republican primary race is going to turn out. The big question is: will things revert to the historical precedents political scientists have documented over the years? Or are we in a whole new territory this time around? The only way to answer that question is to wait and see – which drives those of us who are political junkies a bit nuts. So where does that leave Cruz? If the Quinnipiac poll from Iowa today is any indication, as Carson drops, Cruz is picking up his supporters. That could mean that the insurgent lane becomes a contest between Trump and Cruz. Will the truce between the two of them survive if that happens? Steve Benen went on record today saying that this development brings on the “shake-up” many have been waiting for in this race – which also presents a difficult question for establishment Republicans. If this continues, and Cruz supplants Carson in the top tier, the nature of the race will fundamentally change. There’s quite a bit of time left on the clock, but it’s now quite easy to imagine Cruz winning Iowa and Trump winning New Hampshire. It creates an interesting question for Republican insiders to kick around: the GOP establishment hates Cruz, but should we assume that it hates Trump more? What I’ve noticed is that while Trump is soaking up most of the oxygen in the press with his outlandish statements, there is increasingly talk about the rise of Ted Cruz. As an example, today Andrew Romano at Yahoo Politics writes: Ted Cruz Has Always Had a Master Plan. Now it Could Win Him the White House. Anyone who says they know how all of this will end is probably fooling themselves. 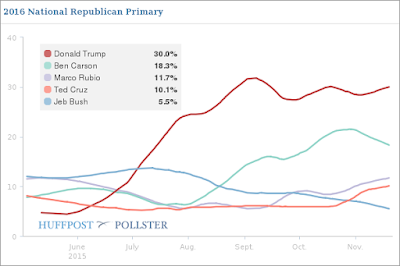 But it seems increasingly obvious to me that it is going to come down to a battle between Trump, Rubio and Cruz.